Uranium is an element well-known for its radioactivity. Here are a collection of facts about the chemical and physical properties of this metal. Uranium has sixteen isotopes. All of the isotopes are radioactive. Naturally-occurring uranium contains approximately 99.28305 by weight U-238, 0.7110% U-235, and 0.0054% U-234. The percentage weight of U-235 in natural uranium depends on its source and may vary by as much as 0.1%. Uranium generally has a valence of 6 or 4. Uranium is a heavy, lustrous, silvery-white metal, capable of taking a high polish. It exhibits three crystallographic modifications: alpha, beta, and gamma. It is a bit softer than steel; not hard enough to scratch glass. It is malleable, ductile, and slightly paramagnetic. When exposed to air, uranium metal becomes coated with a layer of oxide. Acids will dissolve the metal, but it is not affected by alkalis. Finely divided uranium metal is attached by cold water and is pyrophoric. Crystals of uranium nitrate are triboluminescent. Uranium and its (uranyl) compounds are highly toxic, both chemically and radiologically. Uranium is of great importance as a nuclear fuel. Nuclear fuels are used to generate electrical power, to make isotopes, and to make weapons. Much of the internal heat of the earth is thought to be due to the presence of uranium and thorium. Uranium-238, with a half-life of 4.51 x 109 years, is used to estimate the age of igneous rocks. Uranium may be used to harden and strengthen steel. Uranium is used in inertial guidance devices, in gyro compasses, as counterweights for aircraft control surfaces, as ballast for missile reentry vehicles, for shielding, and for x-ray targets. The nitrate may be used as a photographic toner. The acetate is used in analytical chemistry. The natural presence of uranium in soils may be indicative of the presence of radon and its daughters. Uranium salts have been used for producing yellow 'vaseline' glass and ceramic glazes. Uranium occurs in minerals including pitchblende, carnotite, cleveite, autunite, uraninite, uranophane, and torbernite. It is also found in phosphate rock, lignite, and monazite sands. Radium is always associated with uranium ores. 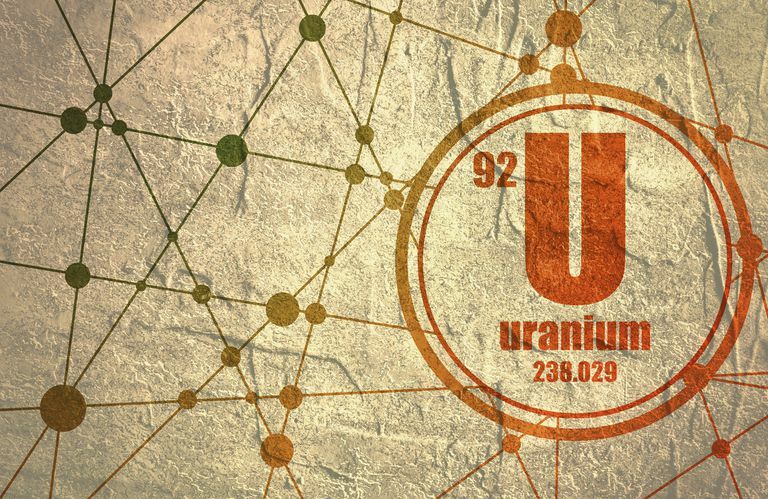 Uranium can be prepared by reducing uranium halides with alkali or alkaline earth metals or by reducing uranium oxides by calcium, carbon, or aluminum at elevated temperatures. The metal can be produced through electrolysis of KUF5 or UF4, dissolved in a molten mixture of CaCl2 and NaCl. High-purity uranium can be prepared by the thermal decomposition of uranium halides on a hot filament.